THIS ITEM IS NOT AVAILABLE AT PRESENT. WE WILL NOT BE GETTING ANYMORE Elvis Presley 12 Ounce Double Wall Ceramic Travel Mug. From the Elvis Presley collection by Vandor. 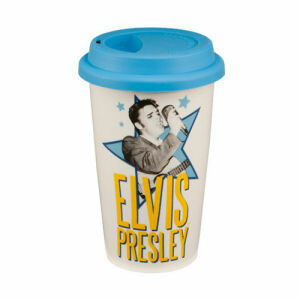 Elvis Presley 12 Ounce Double Wall Ceramic Travel Mug. Double wall ceramic travel mugs have a silicone lid and are dishwasher and microwave safe. Double wall keeps drinks hot! Vandor Elvis Presley Coffee Mugs shipping from Canada. No Surprise Border fees or Customs!